Fortunately, our party was held on a warm day in August so we were able to use the deck and the backyard. Early on, the call went out to anyone that had a monkey lying around their home (plush monkey, that is). Garage sales and school bazaars are another good place to get cheap monkeys. Auntie Clare and my sister volunteered their favorite primates for the day. 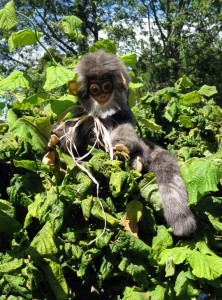 The little guys were found climbing in trees, hanging under the patio umbrella, and sitting on the roof of the gazebo. They looked hilarious. Some were super subtle but effective. To help “monkify” the place, I ordered monkey napkins and paper plates which, upon reflection, I think were totally unnecessary. Plain, brightly coloured items from a Dollar Store would have been just as nice and cheaper. As long as your colour palette is consistent and limited (2-3 colours), it will have impact. We stung streamers on the deck to match the buffets colours and put green streamers and oversized artificial leaves around the gazebo to make it look like the vines from a jungle. I stole (ok…borrowed) a leafy plant from my Mom’s living room, stuck a monkey in it and placed it on the buffet. Voila, instant centerpiece. 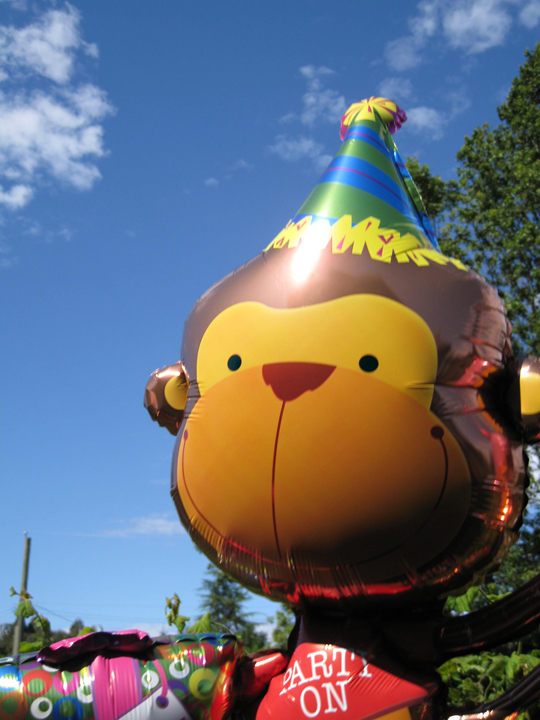 Earlier in the year, I bought a “Balloon Time” disposabile helium tanks with 50 balloons from Costco and used it to fill up a large monkey balloon I bought online. Note: The tank seemed like a good deal but I was shocked to see how small the balloons are that come in the box. Two year olds aren’t exactly a predictable bunch and they definitely don’t participate in group activities for any length of time. For that reason, I bought a few things they could get enjoyment from individually: inflatable beach balls and temporary monkey tattoos (both from Oriental Trading). The monkey beach calls, although cute, did not hold their air very well. Either way, the kids liked kicking them around. The tattoos, on the other hand, were loved by almost everyone. They depicted neon monkeys in a variety of poses and best of all, they came off pretty easily when it was time to take them off (says the girl who put an electric pink monkey on her face). We blew up two of our toddler pools and filled one with inflatable beach balls and the other with toys (as it wasn’t warm enough for swimming). Finally, we put up a couple of tents we had on hand. Anything to make the backyard look interesting, colourful and inviting to explore (it’s a two year old thing). Oh….one more thing…the loot bags were super cute and dead easy. I bought yellow buckets at the dollar store and a bag of yellow happy face balloons. We blew up the balloons, grabbed a permanent marker and transformed the happy faces into monkey faces. 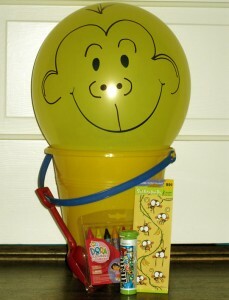 The bucket had crayons, stickers, and mini M&Ms in them. The balloons were taped on top and became the best part (as far as the kids were concerned) of the package. Decorating was fun and not overly expensive. One look at the deck and a quick listen to the monkey music playing in the background and you knew you were in for some monkey fun…OoooOooo…AhhAhh…BABY! Thinking of Planning a Monkey Party? More Monkey Music…Mommy!